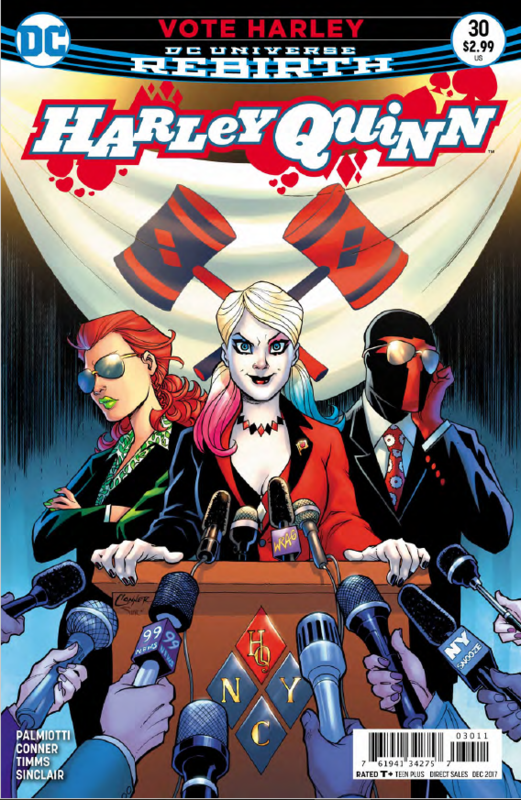 Harley Quinn #30 Review – AiPT! Harley is taking agency in her life and trying to give it to those she might have stepped on or over in her previous life. No matter what Harley Quinn does, her story will always revolve around love: her former love for Joker, her love for her friends and her patients, her love for Poison Ivy and Mason, and, mostly in this arc, her love for New York City. In Harley’s twisted mind, New York is the canvas on which she paints her life and her future. She sees the corruption in government and wants to fix the city she loves, only this time, without resorting to punching people in the face. She hopes. While we deal with the amazingly positive ramifications of her Scarecrow-fueled on-stage brawl with the other two candidates, Harley is also in the midst of personal growth. As Dr. Harleen Quinzel, she has to put aside her patients to focus on her run for mayor, unbeknownst to them, but knownst to us. Her personal affections and those unrequited for her are also of growing concern. As are the giant vines sprouting from Central Park, but, hey, there’s only so much a girl can handle at once. When it comes to the love quadrangle, I have some concerns. Red Tool, goofy as he is, has the potential to be a real problem later, should his longing for Harley turn aggressive. Madam Macabre seems to have her thumb on him for now, in favor of her own son, Mason, for whom Harley has feelings. This, of course, leaves out poor Poison Ivy. She and Harley seem to have established a firm relationship that has its benefits, but Ivy still carries a torch for Manhattan’s mistress of mayhem. It’s tough to see the way Harley moves on as just a natural progression, but she certainly didn’t use Ivy, even if that’s what Harley Sinn implies in Iago-esque fashion. While several pages of Scarecrow torturing the mayor is nice, I hope we can get to the meat of this plot soon. It’s certainly not the biggest story in the DCU currently, but in Harley’s world, this is a big deal and should have significant ramifications for the book moving forward. Harley is, in her own way, taking agency in her life and trying to give it to those she might have stepped on or over in her previous life. Let’s hope she gets a shot to do so. Harley is, in her own way, taking agency in her life and trying to give it to those she might have stepped on or over in her previous life. Let's hope she gets a shot to do so. Harley happy, even for just a moment, is lovely.